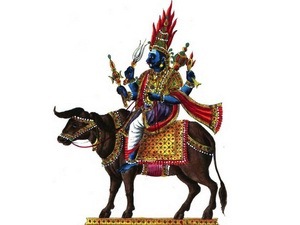 Yama Dwitiya is observed on Dwitiya Tithi during Kartik month. Most of the times, Yama Dwitiya falls two days after Diwali Puja. Yamraj, the lord of death, is worshipped on Yama Dwitiya along with Chitragupta and Yama-Doots, the subordinates of Lord Yamraj. The Aparahna is the most suitable time for Yama Dwitiya Puja. Yamuna Snan is suggested in the morning before Yamraj Puja during Aparahna. Arghya should be given to Lord Yama after Puja. Apart from Yama Puja, the day is more popularly known as Bhai Dooj. As per Yama Dwitiya legends, Goddess Yamuna fed her brother Yamraj on Kartik Dwitiya at her own home. Since then this day is known as Yama Dwitiya. It is believed that sisters who feed their brothers on this auspicious day would be forever Saubhagyavati (सौभाग्यवती) and eating at sisters home bestows long life to brothers. Hence, on Bhai Dooj, sisters cook sumptuous food for their brothers and feed them with their own hands.